The three habits of highly effective tomatoes. Determinate plants produce all of their fruit pretty much at once, and are generally shorter and bushier than their indeterminate relatives. Indeterminate plants grow as long as the season will allow, and can reach many feet high with the right conditions. They can be grown in cages, but will overwhelm the cage when they get a particulary good growing season. They can also be grown vertically on a trellis, which will allow them to reach for the sky and receive plenty of light. I did some research to better understand the habits of my young plants. It turns out all the plants I worked with last year except the Roma Tomatoes are of the Indeterminate variety. This certainly explains why my Roma plants were relatively small and many of the other varieties outgrew their cages. One new variety for this year, Siberian, is also of the determinate variety. This year, I plan to build trellises for the four new fully raised beds that aren’t already earmarked for Potato Production. I will probably use one of these to grow additional beans, and the others to grow tomatoes. This is also a good way to begin a crop rotation to minimize pests. I can train some of my indeterminate tomatoes to grow vertically in the back rows of my beds one year, and plant beans in the same location the next year. Much of this learning and the idea to grow tomatoes on trellises instead of in cages come from a couple great articles on Judy’s Square foot garden blog. This is the smaller purple variety that grows in cornfields. Fruits are 1-1½” and have a sharper flavor than most other varieties. Typically does not burst through husk when ripe. 70-90 days from transplant. abundance of extra large fruits, some weighing 1 1/2 pounds, praised for their delicious meaty flavor. Deep red, smooth, firm fruits. Named for the Crimean peninsula in the Black Sea. Slightly flattened 4-5″ globes with dark greenish-black shoulders, turns almost black with enough heat and sun. Excellent full flavor. Indeterminate, 69-90 days from transplant. Listed in Ben Quisenberry’s 1976 seed list as, “Large, yellow, streaked red; firm and smooth. Very little acid. The sweetest tomato you ever tasted…..a gourmet’s joy when sliced.” Our finest bi-colored tomato and one of our all-time favorites. Winner of the 2008 tomato tasting. Indeterminate, 90 days from transplant. Green 1½ – 2½” fruits with various shades of yellow to yellowish-green stripes, sweet zingy flavor. Very productive plants, sure to be a best seller at market. Introduced in 1985 by Tater Mater Seeds. Indeterminate, 75-80 days from transplant. An All-American Selection! Golden-orange fruits have a mild, non-acid flavor. They are large, globular and smooth with a meaty thick-walled interior. Very prolific plants continue producing throughout the entire growing season. 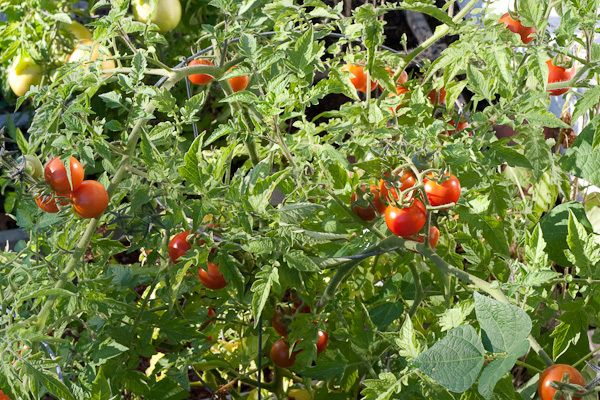 Hundreds of round ½” fruits give an incredible flash of rich tomato flavor, great for salads or selling in pints. One of the best. Indeterminate, 60-70 days from transplant. Deliciously sweet, bite-sized red tomatoes can be used in salads or served on toothpicks as appetizers. A heavy-yielding variety used for preserves, solid-pack canning, tomato paste and puree. Very little juice and of mild flavor. Dwarf sprawling plants with very early sets of fruits. Introduced through SSE in 1984 by Will Bonsall, originally from the Lowden Collection. Egg-shaped 2-3″ fruits, good strong flavor. Not to be confused with Siberia, because Siberian is superior in all qualities. Determinate, 57-60 days. One of the four Czechoslovakian tomato varieties sent to the U.S. by Milan Sodomka. Potato-leaf 4′ plants loaded with 2½” by 2″ diameter fruits borne in clusters. Extremely early, great flavor. Heavy yields all season. Produces well in northern climates. Indeterminate, 55-70 days from transplant. Large pink beefsteak fruits to 2 pounds. Incredibly rich, delightfully intense tomato flavor. Indeterminate, 90 days from transplant. Next story Finally, the perfect game for my Phone. Previous story Growing Potatoes, vertically! PS: I want a topsy truvy!